Electrify America tackles demand charges, Proterra pitches “cash for clunkers” for buses, and other highlights from a summit on the future of mobility. What will EV charging look like in 10 years? Electric vehicle sales increased across key global markets last year. In the United States, EV sales increased by 81 percent compared to 2017. Yet policymakers, automakers and technology companies are still working on the right mix of policies to keep momentum moving forward for e-mobility. This week, more than 500 automotive, energy and technology executives gathered in San Francisco at Bloomberg New Energy Finance’s summit on the future of mobility. Greentech Media was there and compiled some highlights. In an interview with Electrify America COO Brendan Jones, BNEF energy analyst Nathaniel Bullard asked if fellow EV charging station network operators ChargePoint and EVgo could be potential partners for future cycles of Electrify America’s expansion. ChargePoint has previously expressed concern that the settlement with regulators that gave birth to Electrify America gives the VW subsidiary a leg up on its competitors. Bullard also asked Jones how Electrify America plans to maintain EV charging-station utilization rates and hold down demand charges going forward. “To have good utilization at all EV stations, you need robust EV car sales. That’s the number-one variable,” said Jones. Jones said the availability of electric vehicles with 200-300 or more miles of range is beginning to ease consumers’ concerns about range anxiety. The solution, he said, calls for a two-part strategy: utility rate reform and demand mitigation — either via software or batteries and peak-shaving. Jones noted that Electrify America had just announced a partnership with Tesla to deploy storage in high-demand utility districts across the country. Under a deal announced Monday, Tesla will install battery storage systems at more than 100 Electrify America charging stations across the United States. “If a charging service provider, such as myself, passed on demand charges to the consumer, nobody would buy an EV because your charging event would be so expensive,” said Jones. He told Reuters that if demand charges were passed on to the customer it would cost $70-$110 to charge an electric vehicle in a high-demand charge market. “Cash for clunkers” for buses? Remember the “cash for clunkers” program? In June 2009, President Obama signed legislation creating the Car Allowance Rebate System — colloquially known as the “cash for clunkers” program. The short-lived program had two goals: stimulate new car sales in an economy still mired in recession, and getting older, high-polluting vehicles off the road. Consumers were offered rebates worth up to $4,500 to swap gas-guzzlers for more fuel-efficient vehicles. Proterra CEO Ryan Popple wants to replicate the program for public transit buses. Yes, such a program would benefit the electric bus-maker Proterra. But Popple’s focus is on the emissions lock-in associated with conventional diesel buses on the road today. The problem for the climate, Popple said, is that diesel buses deployed with financial support from the federal government are required to be on the road for at least 12 years. “Any city that we didn’t get to that puts diesel buses on the road in 2019, those will still be polluting outside the window of time where we have to have solved this emissions problem,” he said. 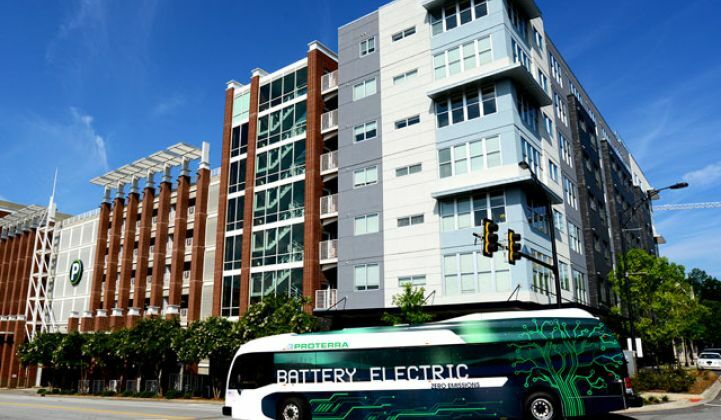 An additional benefit coming with deploying electric buses is that public transit agencies and utilities will often have to partner to upgrade aging grid assets. During a panel on the “refueling” site of the future, BNEF’s Bullard asked panelists what the EV charging experience will look like for customers a decade from now, when electric vehicles account for a much larger — say, 30 percent — share of new car sales. “By the time you reach that 30 percent mark, the refueling experience will not be 30 minutes. The technology exists today, and will continue to evolve, to make for a relatively short experience that can come close to what we experience today with a gasoline-powered vehicle,” said Martin Gafinowitz, senior vice president with the industrial conglomerate Fortive. “The best user experience is the one I don’t even need to have,” said Frank Muehlon, head of global electric vehicle charging for the Swiss engineering giant ABB. “If I can just charge at home, conveniently, if I can just charge at my workplace, I do not really need to think about it — that’s perfect,” he said. He also said EV charging companies are getting some user-experience basics wrong. “What I see right now is operators putting the chargers out there, one beside the other. Every gas station has a roof, right? If I’m an EV driver, I stand out in the rain,” he said. “We really need to look at what the consumer experience is,” agreed Rebecca Shelby, Ford’s manager of electrification policy and standards. “We do need good grid-balanced technology at home. We need good destination charging,” he said. He added that companies in the electric mobility ecosystem also need to optimize the use of fleets. He said BP is researching what those hubs should look like and where they should be located.